Hello and welcome to the 495th installment of the SWD. Hayat Tahrir al-Sham raided Islamic State’s Bara al-Shishani headquarters near the city of Jisr al-Shughur, west of Idlib. Hayat Tahrir al-Sham killed the headquarters’ deputy ‘leader’, Abu Said al-Shishani, as well as arrested two elements, including the group’s ‘general administrator’ of Jisr al-Shughur region, Abu Aisha al-Sahli. 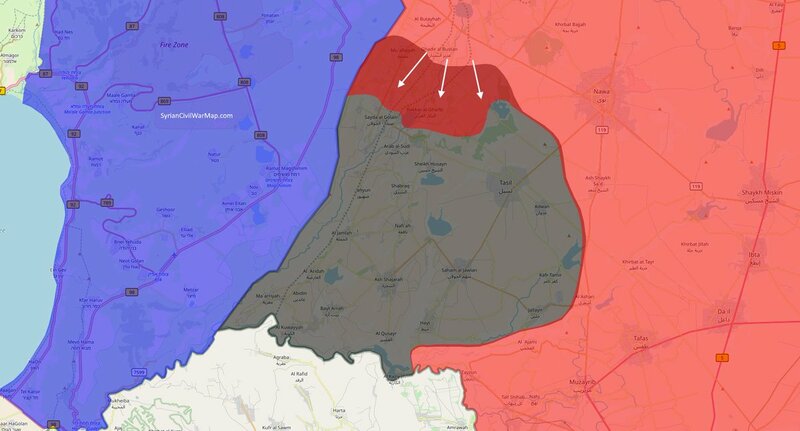 Syrian Arab Army and allies captured Bakkar al-Gharbi, Al-Bassah al-Sharqi, Bakkar al-Sharqi, and Bakkar al-Jubayliyah in southern Al-Quneitra from the Islamic State-affiliated Jaysh Khalid ibn al-Walid. Israeli Defense Forces downed a Syrian Arab Air Force’s Sukhoi Su-22 with two MIM-104 Patriot’s surface-to-air missiles, as the warplane entered Israel-held Golan Heights region. The warplane was conducting air raids against the Islamic State-affiliated Jaysh Khalid ibn al-Walid in Al-Yarmouk basin and accidentally crossed over the border. The warplane crashed near the city of Tasil, and its pilot, Colonel Omran Mare was killed in the encounter. Afghan National Security Forces killed two elements of the Islamic State in Derzab district. Afghan National Security Forces killed two elements of the Islamic State and destroyed a camp in Khogyani district. Islamic Emirate of Afghanistan (Taliban) attacked an Afghan National Army’s patrol in Ghani Khel district. Two elements of the Afghan National Army were killed and four wounded, as well as an armored vehicle destroyed in the attack. Islamic Emirate of Afghanistan’s improvised explosive device destroyed an Afghan National Police’s vehicle, killing two and wounding two policemen in Peer Sahib Bagh area of Surkh Rod district. Afghan National Security Forces destroyed two Islamic Emirate of Afghanistan’s camps in Saydabad district. Three elements of the Afghan National Army surrendered to the Islamic Emirate of Afghanistan in Akazo area of Mughab district. Islamic Emirate of Afghanistan’s Al-Emarah News stated that the group attacked Afghan National Security Forces’ positions in Feroz Koh, Shab Shadgi, Ghulam Hasanha, and Baihan areas of Firozkooh (Chaghcharan) district. According to Al-Emarah News, the group overran the aforementioned areas, killing at least three elements of the Afghan National Security Forces in the process. Islamic Emirate of Afghanistan launched large-scale operations against the Afghan National Security Forces in Qarabagh district, reportedly overrunning two bases and nine checkpoints. Islamic Emirate of Afghanistan’s Al-Emarah News stated that the Afghan National Security Forces withdrew from two checkpoints and a large base in Gayan district. After this withdrawal, the Islamic Emirate of Afghanistan is reportedly in full control of Gayan district. Afghan National Security Forces seized two motorcycles from the Islamic Emirate of Afghanistan in Arghandab district. Afghan National Security Forces cleared the villages of Saydan and Daghyan in Jerashk district from the Islamic Emirate of Afghanistan’s presence. Islamic Emirate of Afghanistan’s Al-Emarah News stated that the group launched several attacks against the Afghan National Security Forces in Nari Manda, Zarh Pol, Naqal Abad, Zarghon Killi, Parchawi, and Quba Charrahi areas of Nad Ali district. According to Al-Emarah News, 29 elements of the Afghan National Security Forces were killed and wounded, as well as two armored personnel carriers destroyed, while two elements of the Islamic Emirate of Afghanistan were killed in the encounters. Afghan National Army’s commander Khudaidad and three elements of the army defected to the Islamic Emirate of Afghanistan in Kafir Band area of Arghandab district.